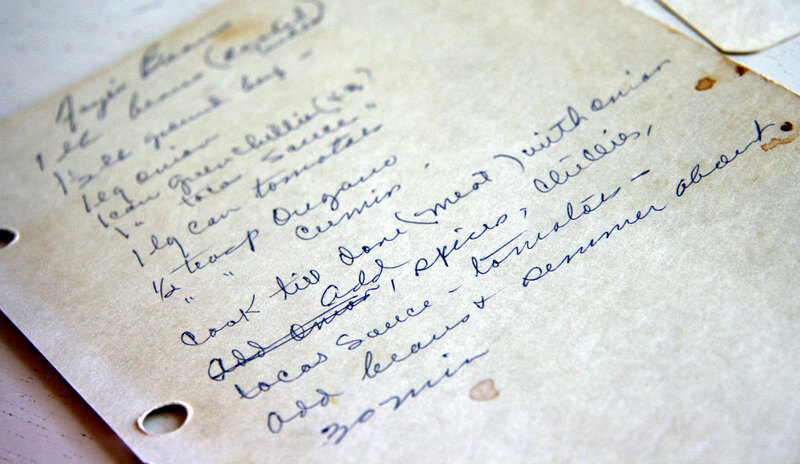 I am fortunate to have some old cookbooks which were once owned and used by David’s grandmother, Memaw Lucy. She was a great cook. She would make us great breakfasts of homemade biscuits, eggs, and bacon, and by the time we were done eating, we could hardly move. Part of the reason was she’d insist that we have more! “An egg is just two bites. Have another!” And because it was all so delicious, we just couldn’t resist. So now, I have these old cookbooks which are almost falling apart. I love looking through these worn books, and I decided I want try out more of the recipes. I found some recipes which had been written out several times. It kinda reminded me of the way I will print out a favorite recipe, and I end up having several copies of them all over the place. I prefer her handwritten version however. These recipes must have been popular, and I want to try some of them first. Some of the recipes are fraying around the edges and have spots on them. These may have been frequently referred to recipes, and I definitely want to try them first too! There are all kinds of recipes. There are quite a few jello salads. Several recipes include buttermilk. One that just sounds really unusual to me is a cake recipe which has orange slices in them. Not fresh orange slices, but those candy citrus jell orange slices! I have no idea what that might be like, but I am going to find out! So one of the first recipes I made is called Faye’s Beans. This dish has shot up to the top of David’s favorite meal list. Here’s the recipe, and I also have the pdf linked up above for printing or saving purposes. Brown the hamburger with onion.Add spices, chiles, taco sauce and tomatoes. Add beans and simmer about 30 minutes. We have had it two nights in a row. We eat it in a bowl with corn tortillas. We also wrapped it up in corn tortillas like a soft taco. I think it would be great as a burrito filling too. 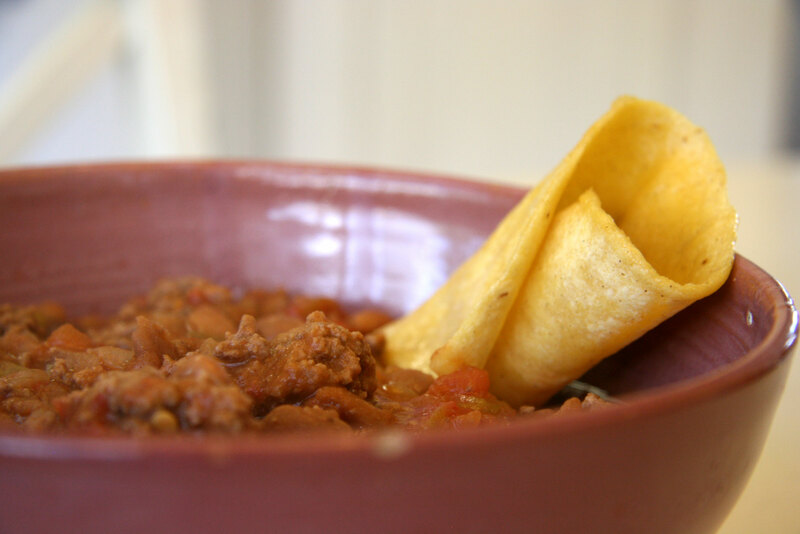 This entry was posted in Cooking and tagged beans, chili, pinto beans by cpeezers. Bookmark the permalink. I always use cumin in my beans. Even when I *gasp* buy canned refried beans, I add it & salsa. I made red beans & rice last night. Yum. It is fun cooking with well-loved recipes! These sound amazing, Christina!! I would definitely cook the beans with cumin seeds and chili powder, too. The 40z can of taco sauce would most likely be made by Old El Paso. They also have diced and whole green chilis in this size can. Family recipes are the best! Love the name – Faye’s Beans. Nothing fancy, just the facts. I’ll have to save this one. Looks and sounds yummy. One of my most cherished recipes from my mother-in-law is for White Mountian Fudge. She lost the recipe and realized I had a copy of it when I sent them some one Christmas. I only make it if I can gift some of it away as it is so sweet. Mmmmm…that sounds delicious. The photo with the tortilla piece is GREAT! Ooh, I love old cookbooks. I just added another one to my collection last week from the 40’s. I do wish I had my grandmother’s recipe box, but my mother has it and I have about as much chance of getting my hands on it as I have winning the lottery! Sigh…. I agree that those beans would make a most excellent burrito filling! I was raised in Texas and it sounds like perfect Tex-Mex food to me!